Although many people think of tomatoes synonymous with the Mediterranean, tomatoes actually originate from South America (probably Peru) where they grew as small bitter berries on bushes. The tomato was domesticated in Mexico (the name "tomato" is from the Aztec tomatl which means "plump fruit"). Some historians believe that after conquering the Aztec city of Tenochtitlan (Mexico city), the Spanish explorer Hernan Cortes brought the tomato to Europe in 1521. Other historians actually believe that Christopher Columbus brought the tomato to Spain as early as 1493. In any case, after it was imported into Spain in the 16th century, it was used as an ornamental plant only, as it was thought to be poisonous. Indeed, tomatoes are in the family of nightshade which are known to be enriched with chemical defenses that are often toxins. In France and Italy it was nick-named "golden apple" (hence the Italian name pomodoro). When tomatoes were discovered as an edible fruit, it spread throughout Spain, then Italy and Southern France, and eventually to England where it was not established until the 19th century. Today, China is the largest producer, accounting for 1/4 of all global output, followed by the U.S. For so-called processing (Roma) tomatoes, California accounts for 90% of U.S. production. Botanically, tomatoes are fruits and technically are berries (because they fit the definition of a fleshy fruit with seeds and pulp produced from a single ovary that ripens into an edible pericarp), but are treated as vegetables perhaps because of their low sugar content compared to most fruits, and their large glutamic acid content which adds a savory flavor. Tomatoes have 4 major tissues - 1) skin, 2) outer fruit wall, 3) central pith, and 4) semi liquid jelly surrounding the seeds. Most of the aroma is in the skin and outer fruit wall and most of the acid and vitamin C is in the jelly. There are over 7,500 varieties of tomatoes distinguished by shape and size and color. It is estimated that 30 mutations of the 35,000 tomato genes are responsible for most the varieties which have been exploited for breeding. Globe tomatoes are the common commercial tomato used for processing and fresh eating. The oblong Plum tomatoes are commercially used for paste and sauces. Beefsteak tomatoes are large and have thin skin and shorter shelf-life. Cherry tomatoes are small and round while grape tomatoes are small and oblong and a variation of the plum tomato. Campari tomatoes are of intermediate size, between cherry and plum tomatoes, and are characterized by sweetness, low acidity. Many common tomatoes are generally hybrids, which are crosses between varieties selected for certain attributes (appearance, disease resistance, climate hardiness, etc). Some of these hybrids include Campari, and Super Sweet 100. In contrast, heirloom (or heritage) tomatoes are non-hybrid, non-genetically modified cultivars grown naturally from heirloom seeds, in which breeding has been uncontrolled due to open-pollination. This results in varied genetic traits but which are stable over many generations – providing a consistency over 50-100 generations. Thus, such heirloom varieties have a provenance, and were often grown during earlier historical periods and are not used in modern, large-scale, commercial agriculture. Popular heirloom tomatoes include the Red and Yellow Brandywine with its sweetness; the Striped German and Pineapple varieties with their characteristic two-toned skin and flesh; the Purple Cherokee with its unusual violet color, large size, and mixture of sweetness and acidity; the Green Zebra which can be fully ripe and still maintain a green color; and the Big Rainbow which bears monster-size fruits up to 2 pounds in size. San Marzano tomatoes are a variety of plum tomatoes which are considered by many to make the world's best tomato sauces. The first seed of the San Marzano is thought to have been a gift from the Kingdom of Peru to the Kingdom of Naples and was planted in volcanic soil near Mount Vesuvius, near what is now the commune of San Marzano. Compared to Roma tomatoes, San Marzano tomatoes are thinner and pointier, have thicker flesh with have less seeds, and a stronger, bittersweet, less acidic taste. By Italian law, only such tomatoes, grown in the Italian Sarno Valley, can bear the "DOP" (Protected Designation of Origin defined by European Union law) emblem when canned. San Marzano seeds, imported from Italy, are available to be grown as an heirloom variety. Tomatoes are eaten raw or cooked, as an ingredient in many dishes, and is also available in many preserved forms such as canned, pureed, juiced, sun-dried, and in condiments. Tomato ketchup began production in the 1830s. Tomatoes play a key role in Iberian, Italian, Provençal, Basque, and Languedocian cookery, as well as in most other European cuisine. Unlike most kinds of canned produce, canned tomatoes can have the intense flavor of ripe fruit. Canned tomatoes can even sometimes have a fresher taste than supermarket-bought tomatoes because commercial tomatoes are picked green and hard in order to survive shipping, then sprayed with ethylene gas which turns them red but does not alter the underdeveloped flavor. Even "vine-ripened" tomatoes, which may have better color and texture than supermarket globe tomatoes, are picked when only 10% of the fruit has turned red which improves their flavor only marginally. In contrast, tomatoes picked for canning are picked ripe and processed promptly. Canned tomatoes are generally crushed by machine, and then heated to remove microorganisms. While "peeled" canned tomatoes are popular, the peeling is usually performed with lye or by hot steam and pressure, and peeling also removes a rich source of lycopene. The best tomatoes are likely to come from your own garden or a local grower or farmer's market. The most flavorful tomatoes are grown in rich soil, not hydroponically, and in the open sun, not in a hothouse. Tomatoes – especially unripe green tomatoes – should be stored at room temperature, as their flavor and texture degrades in refrigeration, especially below 55°F, which breaks down the cell walls. Fully ripened tomatoes stored in the refrigerator should be allowed to recover at room temperature for a day to allow the flavor to be salvaged. Comparison tests of tomatoes stored facing up or down has found that tomatoes should be stored with its stem end facing down, which probably prevents moisture loss and bacteria and mold from entering through the cut stem site. Heating tomatoes at temperatures <185°F increases the lycopene form that is absorbed, and this temperature limit preserves the lipoxygenase enzyme that is required for full tomato flavor. Heating about 185°F – sometimes used commercially to preserve a thickness by destroying enzymes that break-down the pectin that binds cells – also destroys flavors. The gel surrounding the tomato seeds is richer in savory glutamates than the tomato flesh, so removing seeds while preserving the gel is more trouble than it's worth; in addition, the seeds are not thought to contribute either flavor or bitterness. Tomatoes are rich in carotenoids, such as lycopene which gives lends a bright red color. Lycopene is an angiogenesis inhibitor which suppresses signaling by PDGF and Platelet Activation Factor. In animal studies, lycopene suppresses cancers of the breast, liver, colon, prostate, as well as suppresses metastases. Tomatoes also contain flavonoid molecules which inhibit angiogenesis signaling. The alkaloid, tomatine is a molecule in the stems and leaves of tomato plants that has also been found to inhibit the COX-2 pathway in cells. Interventional studies have demonstrated the anti-cancer effects of lycopene. In one study, 32 men who were recently diagnosed with early stage prostate cancer were instructed to eat one meal per day incorporating commercially made tomato sauce containing 30 mg of lycopene for 3 weeks. They then underwent curative prostatectomy; examination of the removed prostate tissue showed a 3-fold increase of lycopene concentration in the prostate tissue, along with a slight decrease in prostate specific antigen (PSA) level found in the blood. In a separate study, 41 men with recurrent prostate cancer were asked to consume a tomato-rich diet to achieve a minimum lycopene intake of 25 mg /day along with 40 g/day of soy protein for a total of 8 weeks. The mean serum VEGF levels of all the subjects was reduced from 87 to 51 ng/ml in a statistically significant way, and 34% of the men experienced reduced PSA levels. In the Health Professionals Follow-Up Study of over 51,000 men, the population who consumed the most lycopene (highest quintile) was found to have a 15% risk reduction for developing prostate cancer compared to men in the lowest quintile. The risk reduction was even greater if tomato sauce was ingested; men consuming more than 2 servings/week had a nearly 23% risk reduction compared to men consuming less than 1 serving/month. Tomatoes are in the nightshade family – same as paprika, chilli pepper, potato, and eggplant; but also tobacco and belladonna. Natural alkaloid chemicals in the nightshade family include nicotine, atropine, and scopalamine although these are not found in tomatoes. 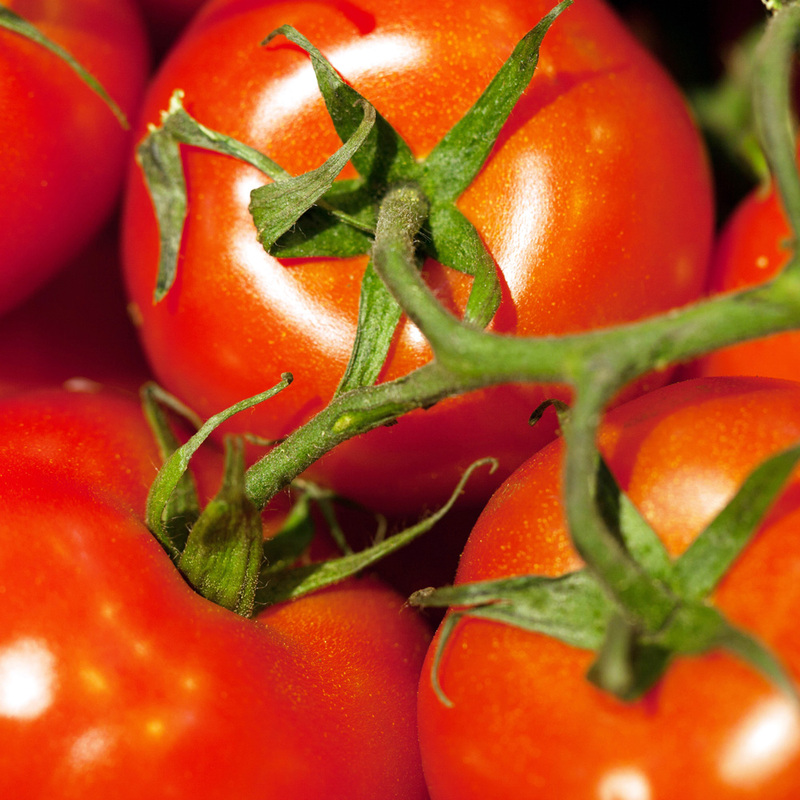 Certain tomatoes have been found to have higher levels of lycopene, including the San Marzano tomato from Italy. Fresh tomatoes cook down well to a smooth puree but this is often not achievable using canned tomatoes because of the calcium salts additives –used to firm the cell walls and keep the fruit intact– interferes with the disintegration of the tomato during cooking as well. As tomatoes ripen on the vine they accumulate more sugar, acid, and aroma compounds, including furaneol –which resembles a sweet-savory caramel. This ripening process is not reproducible by the ethylene gas used to redden commercial tomatoes picked at their green stage for mass supermarket use. Tomatoes are botanically fruits and technically berries, but are treated as vegetables in practice. In 1893, the U.S. Supreme Court ruled the tomato is legally classified as a vegetable because it is used as one. Lycopene, an anti-angiogenic molecule in tomatoes, is more active when heated leading to nearly 15% higher levels in the blood after ingestion. Cooking the tomato in olive oil is even better, increasing the amount of lycopene in the blood by 40%.